Oskar Schlemmer (4 September 1888 – 13 April 1943) was a German painter, sculptor, designer and choreographer associated with the Bauhaus school. In 1923 he was hired as Master of Form at the Bauhaus theatre workshop, after working some time at the workshop of sculpture. His most famous work is "Triadisches Ballett," in which the actors are transfigured from the normal to geometrical shapes. Also in Slat Dance and Treppenwitz, the performers' costumes make them into living sculpture, as if part of the scenery. Born in September 1888 in Stuttgart, Oskar Schlemmer was the youngest of six children. His parents, Carl Leonhard Schlemmer and Mina Neuhaus, both died around 1900 and the young Oskar lived with his sister and learned at an early age to provide for himself. By 1903 he was completely independent and supporting himself as an apprentice in an inlay workshop, moving on to another apprenticeship in marquetry from 1905 to 1909. 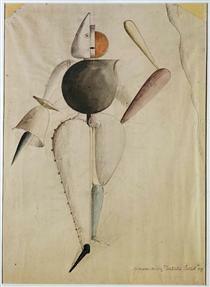 Oskar Schlemmer studied at the Kunstgewerbeschule as well as the Akademie der Bildenden Künste in Stuttgart under the tutelage of landscape painters Christian Landenberger and Friedrich von Keller. In 1910 Schlemmer moved to Berlin where he painted some of his first important works before returning to Stuttgart in 1912 as Adolf Hölzel's master pupil. In 1914 Schlemmer was enlisted to fight on the Western Front in World War I until he was wounded and moved to a position with the military cartography unit in Colmar, where he resided until returning to work under Hölzel in 1918. 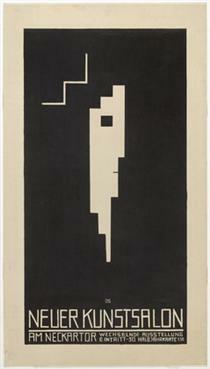 In 1919 Schlemmer turned to sculpture and had an exhibition of his work at the Gallery Der Sturm in Berlin. After his marriage to Helena Tutein in 1920, Schlemmer was invited to Weimar by Walter Gropius to run the mural-painting and sculpture departments at the Bauhaus School before heading up the theater workshop in 1923. His complex ideas were influential, making him one of the most important teachers working at the school at that time. 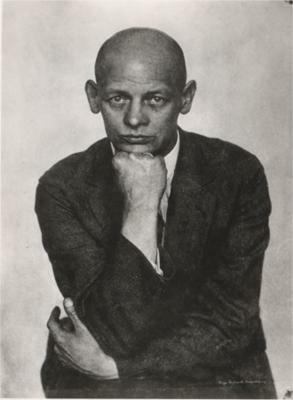 However, due to the heightened political atmosphere in Germany at the end of the 1920s, and in particular with the appointment of the radical communist architect Hannes Meyer as Gropius's successor, in 1929 Schlemmer resigned his position and moved to take up a job at the Art Academy in Breslau. 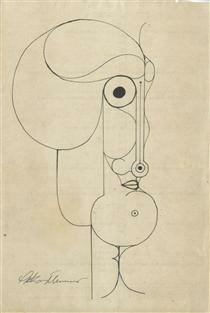 Schlemmer became known internationally with the première of his 'Triadisches Ballett' in Stuttgart in 1922. His work for the Bauhaus and his preoccupation with the theatre are an important factor in his work, which deals mainly with the problematic of the figure in space. People, typically stylised faceless female figures, continued to be the predominant subject in his painting. While at Bauhaus, he developed the multidisciplinary course "Der Mensch (The human being)." In the human form he saw a measure that could provide a foothold in the disunity of his time. 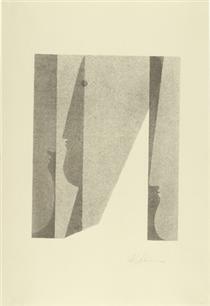 After using Cubism as a springboard for his structural studies, Schlemmer's work became intrigued with the possibilities of figures and their relationship to the space around them, for example 'Egocentric Space Lines' (1924). Schlemmer's characteristic forms can be seen in his sculptures as well as his paintings. Yet he also turned his attention to stage design, first getting involved with this in 1929, executing settings for the opera 'Nightingale' and the ballet 'Renard' by Igor Stravinsky.